Stikers made with high quality cutted vinyl. Original PTS colours. Size: 160x230mm. Autocollants fabriqués avec du vinyle coupé de haute qualité. Couleurs PTS d'origine. Taille: 160x230mm. 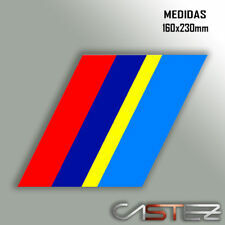 Tipo de Vinilo /Vinyl Type. Vinilo apto para cristal, chapa, madera, plástico, pared (cualquier superficie lisa no rugosa). Calidad del vinilo - Vinilo de corte 5/7 años. - Vinilo impreso y lamindado 7 años. Stikers made with high quality cutted vinyl. Original PTS colours. Autocollants fabriqués avec du vinyle coupé de haute qualité. Couleurs PTS d'origine. 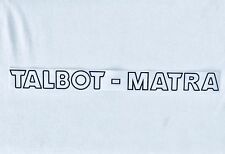 TALBOT MATRA REAL DECAL DECAL FOR MATRA ULTRA HIGH QUALITY VINYL. GLOSS BLACK . YOU WERE WASHED AT PRESSURE ETC. AVAILABLE IN BLACK MATT. NO CHINESE OR ECONOMIC MATERIALS. WE ONLY WORK HIGH-DURATION MATERIAL FOR EXTERIORS, UP TO 10 YEARS. Grill is not included (obviously), but photo shows our own 205 with them fitted. These are computer-cut from Oracal 651 Premium grade vinyl (5-year) and are simply fitted by overlaying onto your grill as per our photos, and slicing with a sharp knife. 1 X Hayon 205 Rallye. - 2 X Custodes 1,3 Rallye, gauche et droite livré avec transfert. Vinyles inaltérable plastifier pour une résistance supérieur. - 4 X Bandes de Caisse latérale. - 3 X Bandes de Calandre. FITTED TO THE LATER TALBOT AVENGER RANGE. Pare soleil Peugeot Talbot Sport 205 rallye bleu foncé - blue. polisher votre véhicule sans soucis, aucune crainte que les couleurs s'en vont. Haute résistance à l'eau et rayon de soleil. Ne pas coller à l'eau ni savon. 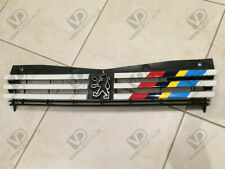 Peugeot 205 GTi/rallye et 205 tous type. 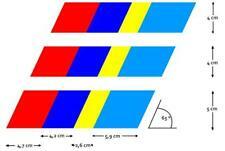 rappe decoupe 3 Stickers bandes autocollants de calandre pour. 309 gti, 405 mi16 le mans etc etc . Autre stickers?. Autre format?. Facile de pose. Pare soleil Peugeot Talbot Sport. polisher votre véhicule sans soucis, aucune crainte que les couleurs s'en vont. Haute résistance à l'eau et rayon de soleil. Ne pas coller à l'eau ni savon. le polymère 15 ans. Tuning Racing Compétition. Support technique. Le kit comprend . Talbot Sunbeam GP4 Arches & Front Spoiler. Fitted to Sunbeam Tiger on the rear wing, Sunbeam Talbot and Rapier on the hubcap. The badges have a single stud threaded with nutand are 3.5cms across. The Backflash stickers are 1250mm wide, which allows for trimming to the width of your window. Talbot insignia de la etiqueta. Badge Type Decorative. EAN Does not apply. Suitable For Body Panel. Finish Glossy. BRILLANTE SERVICIO AMABLE! Grandes etiquetas. Muy feliz. 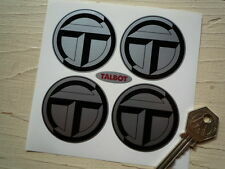 A single, large sized, TALBOT sticker. 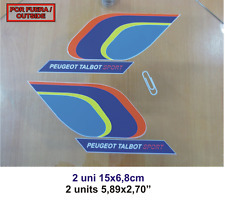 Other SIZES and many more TALBOT & other Motoring stickers and products available on our WEBSITE. Just web search 'I Say Ding Dong' to find us. These are full colour, outdoor suitable stickers and are produced on outdoor grade gloss or semi gloss vinyl of either 75 or 100 grade. If a vehicle is not cleaned properly before the vinyl is installed, the vinyl will fail prematurely. Installing vinyl in temperatures of 55 degrees or less will also cause premature failure. It is important to take care when washing any vehicle or trailer that has vinyl lettering or graphics. 2 x Don't touch my Camper stickers - each 70mm Wide x 50mm High. We always send a sample proof first to make sure you are happy with your stickers. (Minimum 500 stickers). We can do Decals & Stickers for many more Motorbikes, cars etc. Sticker-Designs®. Witterungsbestaendig, kratzfest und abwaschbar. UV und Waschanlagen bestaendig. Folie als Schutz-Laminat ueber Motiv. Individuell fuer Sie in Deutschland angefertigt. Deutsche Premium-Folie. Available colours are WHITE, BLACK,and GREY. They will Stick to Just About Any Clean Smooth. dry Surface. The Sticker has NO background, it is NOT re-usable after you've applied it but can be removed. Esta placa tiene pad 4. Hay 4 agujeros de montaje. Esta placa grabado al agua fuerte hacia fuera último su coche! Autocollant ancien et authentique. ORIGINAL GARANTI. This item is an ORIGINAL. Simply apply the strip and trim of the excess. Made from high quality 7 year outdoor vinyl. We need to know the following information. to get your instructions regarding colours. we can also put any other wording on. Simply apply the strip and trim of the excess. Made from high quality 7 year outdoor vinyl. to get your instructions regarding colours. and shown in the picture above. we can also put any other wording on. 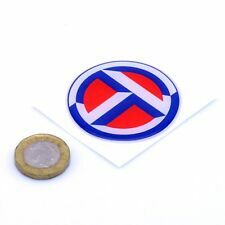 2 x Don't touch my Camper stickers - each 90mm Wide x 60mm High. We always send a sample proof first to make sure you are happy with your stickers. (Minimum 500 stickers). 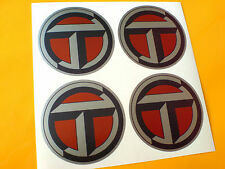 We can do Decals & Stickers for many more Motorbikes, cars etc. Koolart Self Adhesive Graphic. 4x4 Spare wheel Graphic. UV fade resistant and 100% waterproof inks. We can also do different shapes ie: oval ect. and we can test it for you. you can upload it below without purchasing. Elle est pré-percé pour faciliter la pose. Plaque métal. Plaque en métal peint, embossée. En commandant chez plaisir d'enfants. Koolart Self Adhesive Graphic. 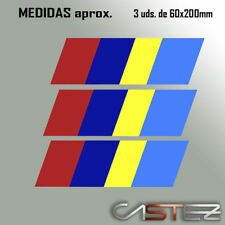 4x4 Spare wheel Graphic. UV fade resistant and 100% waterproof inks. the drop down box. We can also do different shapes ie: oval ect. and we can test it for you. you can upload it below without purchasing. Sie erhalten von uns einenPremium-Aufkleber in hoechster Druckqualitaet, an dem Sie viele JahreIhre Freude haben. Dieser ist auf Kontur, d.h. auf den Umriss desMotivs zugeschnitten. Zudem ist dieser kratzfest, witterungs-,waschanlagen, UV-bestaendig und abwaschbar, ohne zu verblassen!